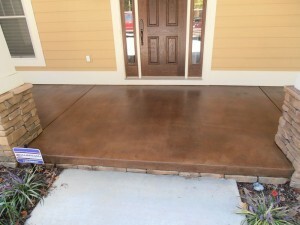 The ideal scenario would be if we could stain concrete that was 30 days old and had never been walked on… but obviously that is not practical, so there are a few things that need to be understood before proceeding with stained concrete. First of all, it is important to say that all concrete can be stained. 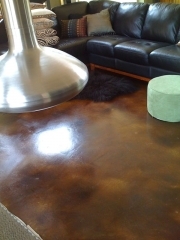 It is our belief that the nuances caused by aged concrete or wear and tear that happens before the concrete is stained only enhances the rustic look of a completed stained concrete floor. Even if your concrete is old, painted, or covered in carpet, we can use our techniques to get your concrete in a condition to become a beautiful stained concrete floor. With that being said, here are a few suggestions for controlling a construction project to create the best possible floor. Click here for more information on transforming existing concrete. Click here for more information on pouring new concrete that will be stained.